Introduced in version 10.5 was the ability to import an image directly into 2D views. That image could then be scaled and resized to suit. 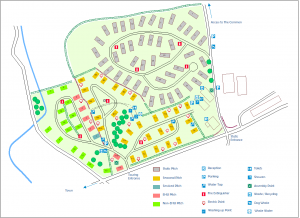 The concept was that you could then trace over features within that image to produce a plan such as the caravan park plan shown below. What was missing however was the ability to rotate the background image and a couple of users requested this facility. The ability to rotate the background image to match your requirements is now introduced. Background images can now be rotated using the familiar object rotation tools. You can manually rotate the image in exactly the same way as you would rotate any other RelMo object. The ability to offset by points and rotate by points is also added to background image objects. However since background images don’t actually contain any normal RelMo points, the normal snap-to-point mechanism used by those commands can’t work in exactly the same way as using these commands when moving ordinary RelMo objects. Instead RelMo creates virtual points wherever you click in a 2D view and uses those virtual points to determine how to offset or rotate the image. This means that you can now set the background image as the active object and move it so that it lines up to match an existing survey or even another background image. The new transparency option for background images allows you to overlay two or more background images and see both at the same time. This means, for example, that you could overlay a road map over a satellite or drone-camera image of the same area. Details not contained in the road map may then be visible in the satellite image. This should make the creation of 2D plans of a scene even easier to achieve. 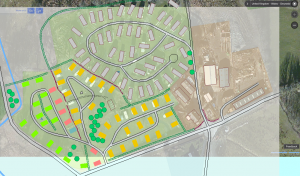 The caravan park plan is shown below with a satellite image and a partially transparent road map.